The choice of a custom-designed shower stall with all the latest features is a luxury we would all like tucked into our master suite. Maybe you prefer a shower to a soak in a tub. Perhaps you would like a whirlpool tub and a shower stall enclosure steps away from each other. Maybe showers are so popular in your family that a tub is not used at all! 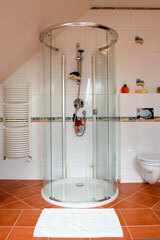 Use of a shower is readily available; there's no waiting for a tub to fill. A shower can be turned on and used almost immediately. Showers are quick and invigorating when you're in a hurry to get off to your busy schedule, and they're soothing at the end of a hot, stressful day. Let's explore some of the shower designs that add to the comforts of home. Bathroom shower stalls are available in a variety of styles and configurations. Prefabricated shower units are manufactured in a whole range of quality levels, from basic home builder models to luxury designer models. These prefab units are usually produced in specific sizes, so you need to have the right space available. 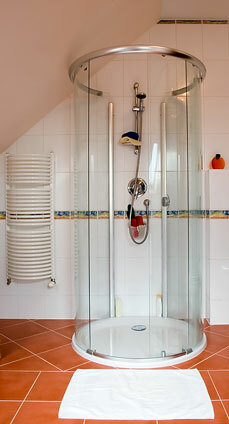 A shower space may be simply a tub/shower combination with the familiar shower curtain and single shower head. While this option is less expensive, it may also be less convenient. It requires you to step into or out of the bathtub, it's harder to keep the shower curtain from blowing into you, and it's hard to keep the shower curtain or shower door tracks clean. These shower/tub units may be fabricated in acrylic or fiberglass, or they may simply be tubs with prefabricated or tiled sides. They might contain only a soap dish, but some of them really do have luxury choices such as extra showerheads or jets and beautiful glass doors. You may wish to choose a shower-only stall model. They come in many shapes — square, rectangular, curved, or angled. They can consist of one seamless piece, or they may have separate shower pans and side panels. 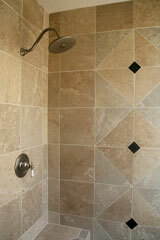 The seamless piece showers are best for new construction where space is easy to access. The multi-piece units are best for remodeling projects. Measure your space, and make sure your plumbing lines up in the right place. Separate shower stalls are being designed into many of the active-adult community homes. As members of this generation grow older, they may appreciate the separate shower stall concept, with its safety, grab bars, and bench seats. Consider this option if you're buying into one of these communities. Other stall showers may be basic, utilitarian units that can be put in place and hooked up to your plumbing quickly. We all probably remember these at the lake cabin — made of metal with the blowing curtain that sent water out all over the bathroom floor. But, they did the job! No bathtub was in sight. The alternative was a bar of soap and the lake. Then there are those weeks at the beach with the outdoor shower. The shower with a wooden enclosure, perhaps with a seat, and a single shower head is Spartan but serviceable. The sand and salt are washed off, and the water just drains away into the yard. Hopefully, the water is warm! Today, custom showers are becoming more common as more products are available. 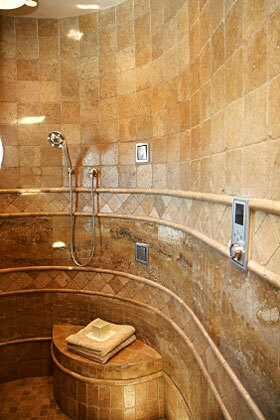 These luxury showers may have ceramic tile, solid surface, or stone covered walls. The base may be cast material or custom built or tiled. These showers require more space if they're large, but they can be designed to fit any area shape with custom applied wall surfaces and made-to-order, tempered glass doors. Multiple or oversized shower heads enhance the "spa" feel. Built-in seats are common. Showers may be designed without shower doors for easier access, which can be especially helpful for handicapped persons. The showerheads and wall dividers for doorless designs must be carefully planned so water doesn't escape into the rest of the room. And if the shower is large enough, why not consider two showerheads — one at each end? These custom shower stalls not only increase your own comfort, but also increase the resale value of your home. 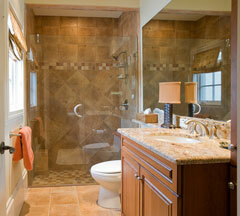 Many home buyers want a separate shower enclosure in the master bath. 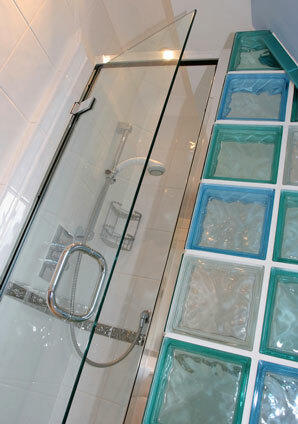 The luxury shower enclosures with their designer wall and floor materials and fittings are in high demand. This leading producer of bathroom fixtures offers bath or shower walls as well as tubs and shower bases. They also have a selection of shower door enclosures and faucets. One of America's leading bath products leaders, Aquaglass manufactures gelcoat and acrylic shower units as well as tub shower units and tub surrounds. They also produce special care showers for handicapped access and steam showers. Manufacturer of luxury acrylic showers and shower bases. Their curved door designs are available in a variety of dimensions and colors. This custom fabricator produces shower pans in stainless steel or copper. These unique shower bases come in a virtually endless array of sizes and shapes. Producer of solid-surface material shower walls and floors. The bases are available in a variety of designs including barrier free models. This company offers a variety of acrylic shower modules with a choice of luxury features. A wide variety of sizes and configurations are available, and some of these units are offered in non-standard acrylic colors.